Our technicians, using a portable test kit, can visit your facility to carry out an on-site assessment of insulating oil quality. 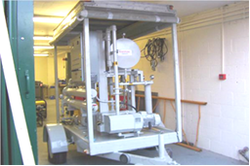 The test results are an important deciding factor in ascertaining whether to retain or replace the oil in switchgear, transformers, oil filled cables and other electrical equipment. British BS148, BS5730a (Automatic proof testing), BS5874. American ASTM D877, ASTM D1816. Dehydration: At minimum oil temperature of 26O C, de-hydration is from 100 PPM to less than 10 PPM or from 50 PPM to less than 5 PPM. Degasification: The process reduces soluble air content in a single pass from full saturation of approximately 12% to less than 0.25%. Other gases in solution with the oil, including combustibles, are also removed. Particle Matter: The fibre glass cartridges provide the removal of particulate matter to a nominal 5 microns. The downstream filters remove particulate mater to sub micron size. The cartridge design structures allow free water to be rapidly separated from the oil even before it reaches evaporation stage. 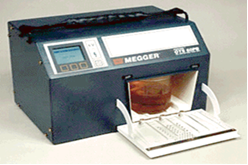 Millions of glass fibres (3-10 micrometer diameter) provide a large total surface for exposure of a thin oil film to the vacuum. Sharp points on the glass fibres promote fast release of gases and vapours from the oil. The elements act as fine filters removing solid contaminants.